The Feelies remain one of America’s great underground bands. These re-releases of their two “late” major label records are a necessary reminder. The Feelies are one of a handful of iconic and truly great American bands. If you've never heard them, most folks will tell you that you need to go pick up their debut, Crazy Rhythms. Or, perhaps, you'll be steered to their proto-Americana masterpiece, the Peter Buck-produced The Good Earth. Those are the albums that make them iconic, but it's the two A&M records they released between 1988 and 1991, long out of print and now re-released by Bar None, that demonstrate just what a truly great and definitively American band the Feelies are. Part of the Feelies' unique sound and sensibility might be linked to their backgrounds. There's a suburban feeling of enclosure to the Feelies' music that is distinct from what one hears in their urban and rural contemporaries of the '80s American underground. Urban punks were trying to break out of their space; rural folk-rock artists explored limitless spaces; but for a suburban band, space is an odd mix of both freedom and confinement. The suburbs offer a different kind of limitation of space than the city. There's a bit more room, but personal and property boundaries are all the more sharply defined for it. If your apple tree branch hangs over my yard, those apples are mine. Where the city dweller may confront limited space by breaking out, the suburban dweller fills the space with his/her character, forming it into an extension of the self. There's something of this sense to the Feelies' music. It feels contained yet full, its space constrained, but all the air within that space is vibrating. Yo La Tengo and the Bongos share this quality in some measure, coming from similar roots. It's music you can dance to without necessarily moving your feet, its powers of motion affecting the brain first and acting upon the torso more than the limbs, yet emotionally freeing. It's driving, energetic, and inspirational while also qualifying as trance-like. The band works as a unit. Co-guitarists Glenn Mercer and Bill Million demonstrate a telepathic sympatico throughout the records, their instrumental interplays wrapping around each other from separate channels. Drummer Stan Demeski and percussionist Dave Weckerman perform similarly in tandem, working off each other to create an undercurrent both solid and fluid. Brenda Sauter remains a criminally unheralded bass player, her work providing the firmament around which all the other parts merge and diverge. The interplay of personalities and instruments in any Feelies song is a mix of strong players each stepping back to let another take the fore. Oftentimes the drama comes from subtractions or absences, odd pauses that amplify a note or hook. In his liner notes for Time for a Witness, Michael Azerrad calls this characteristic a "serene, levitational groove even at high velocity". It has been said that the Feelies don't write hooks, but they're definitely there, just smaller barbed and buried deep. You don't realize the hook's been set until you find yourself hitting repeat almost subconsciously. And you will. Lyrically, Only Life comprises something of a simultaneous internal/external monologue, the "you" in the lyrics as much a reference to the speaker as to any subject, though there definitely is a romantic subject at the heart of the matter. In the opening song that titles the album, Mercer sings "You could lock your doors / Close all your windows and / Hide away", both urging himself forward while trying to guide his paramour away from such denial. So, too, in "Too Much" with its repeated chorus of "Got a ways to go / Too much to know", there's a sense of self-doubt but willful progress. The narrative perspective is one of constant unsettlement married to a persistent striving. In "Deep Fascination" Mercer "Find[s] inspiration / When I walk alone / Never really alone" while "Higher Ground" reveals a sense of destination "Be my light / By my side / If you dare / Be my guide." This is incredibly adult rock 'n' roll, a rare, mature perspective on the frightening vulnerability of reaching out for someone. "Be yourself," Mercer whispers in "The Final Word", "Be yourself / You go on - it's alright." Mercer's lyrics are fragmentary, what Rick Moody calls "ghostly traces" in his excellent liner notes, and they function to recreate, through their simplicity, a greater depth of emotional complexity. The spastic, jubilant "Away" seems to offer the payoff, but it's not a simple one. Even successful seduction brings emotional upheaval and turmoil; this song whirls and roils us in dizzy ecstasy. "Away" may be the perfect Feelies song, the encapsulation of everything they set out to do in their sonic philosophy. It's driving and ever so slightly off kilter, deliberately mining imperfection to create something absolutely perfect, and the live version available with the bonus download is even more frenetic. The song just builds and builds, and if there's a narrative, it's one of building tension. The release comes through the one-word chorus (can minimalist songwriting be any more brilliant? ), a repeated call of "Away" that crowds upon itself, leaving no space, even, for a breath in between utterances. "Now we're really in deep", indeed. 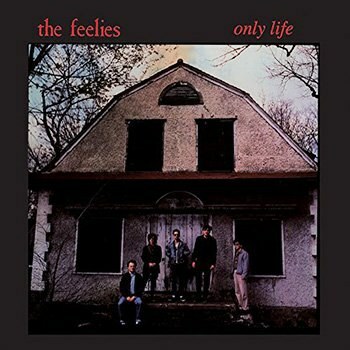 Only Life is the Feelies' masterpiece. Yet 1991's follow-up Time for a Witness does not pale in comparison. 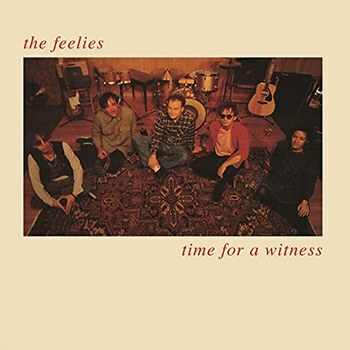 Even though a smaller space of time passed between these than any other two Feelies records, Time for a Witness has its own distinctive character. Less an extension of the previous record, the album offers a more organic, live sound, offering up reflections upon all that had preceded it in the band's history. The instrumentation and playing, even Mercer's lyrics, are all more expansive than on Only Life, and it all works to make this record a fitting swan song. (Well, it was a hell of a swansong until 2011's excellent reunion album Here Before appeared out of nowhere). Once again, Mercer's lyrics reflect upon maturity and the long roads traveled, as in "Waiting": Seventeen, really wired / Slow down, don't forget it / Burn out, if you let it". Meanwhile, "Time for Witness" even hints at a political message with its reference to "false smiling prophets" and the contention "we've made this a living hell". The romping "Sooner or Later" erases any anxiety with its reassuring trivialities in the joy of living, "Call me down / Don't make a fuss / Take the back seat / On the bus." Like on Only Life it's all a search for direction, sometimes to a place away and sometimes home; oftentimes, one gets the sense they can be the same place. It's all back to that sense of freedom within confinement that beats at the heart of the Feelies' music. "What goes on in your mind" is the ultimate escape from life's troubles, because it is therein that one defines what is or isn't troubling. It's the hard-earned embrace of security, of confidence. It's also a fine justification for dancing.